Homelessness in Santa Clara County has gotten worse, with the overall homeless population increasing 13 percent to 7,394 in 2017 over the course of two years. That puts Santa Clara’s homelessness crisis in the same ballpark as San Francisco’s, which has a homeless population of 7,499, according to a 2017 homeless census and survey. Santa Clara also has the third highest rate of chronic homelessness in the entire country. Today, Cisco announced a $50 million donation to Destination: Home over the next five years. The idea is to help put an end to homelessness in Santa Clara County — an area of Northern California that is home to the tech industry’s Silicon Valley. This area consists of cities like Cupertino (home to Apple’s headquarters), Mountain View (home to Google/Alphabet), Palo Alto (home to Facebook), San Jose and Sunnyvale. Cisco has donated an initial $20 million chunk to Destination: Home through its Cisco Fund. The plan is for this money to invigorate Destination: Home’s efforts to achieve its five-year plan to end homelessness, which entails disrupting and transforming homeless response systems, building new housing opportunities and deploying client-centered solutions. 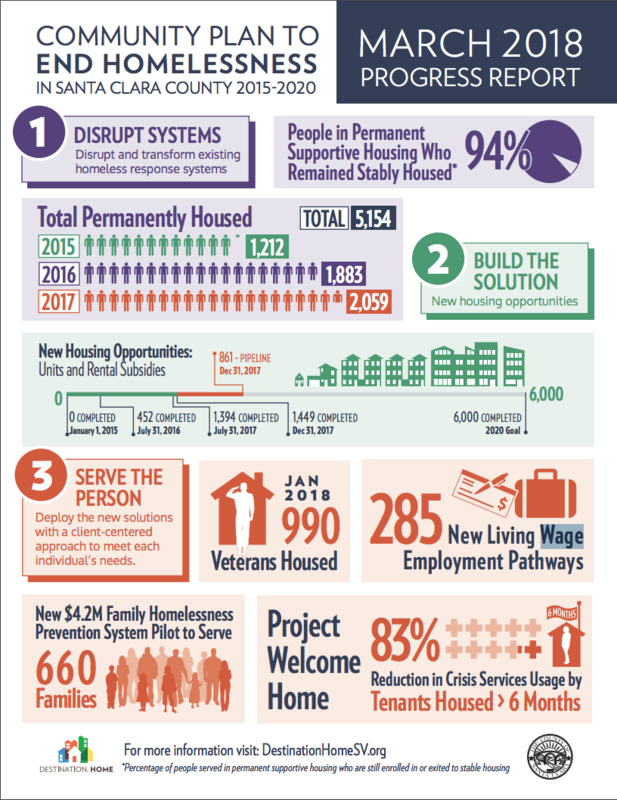 Since implementing the plan in 2015, Santa Clara County has been able to permanently house 5,154 people, according to Destination: Home’s March 2018 progress report. As tech companies grapple with their roles in the displacement of non-tech workers, it’s promising to see some of them try to tackle the problems they helped exacerbate. It’s worth noting Cisco is not the only tech company putting money behind social good efforts. In October, Google committed $1 billion in grants to train U.S. workers for jobs in the high-tech industry.